Where would 2017 World Series Games 2 or 5 rank historically? 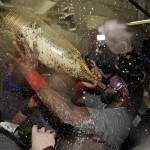 What a World Series! I predicted Houston would win in 6 primarily because I thought Kershaw would get the series back to LA by winning Game 5, but Verlander would shut it down in the 6th game. Didn’t quite happen that way, with both guys pitching well but not getting the result that night. In the end, I honestly think the better team won this series, and Houston’s bottoming-out gambit has now paid off with the first title in their existence. What i’m wondering about now is this: two of these World Series games we just saw were just amazingly good games, featuring massive comebacks, late inning heroics, clutch homers, walk-off hits. No. 20: May 17, 1979: Phillies @ Cubs; Phils, Cubs combine for 45 runs. This is the only regular season game on the list and for good reason; the first inning alone had 13 runs scored. No. 19: Oct. 4, 2003: Giants @ Marlins; Ivan Rodriguez tags out Eric Snow as he tries to bulldoze Pudge at the plate to end the game and send the Marlins to the World Series. No. 18: Oct. 12, 1980: Phillies @ Astros; Phils win battle in 10th to win the NLCS with an epic comeback over Nolan Ryan. No. 17: Oct. 17, 2004: Yankees @ Red Sox; Dave Roberts‘ stolen base and David Ortiz‘s walk-off homer cap the Boston win, an epic part of the Boston comeback from 3-0 down in the 2004 ALCS. No. 16: Oct. 6, 2009: Tigers @ Twins; Twins win a game 163 sudden death playoff game for the AL Central title. No. 15: Oct. 8, 1995: Yankees @ Mariners; Edgar Martinez hits “The Double” to get a walk-off win in the ALDS, capping a 10th inning comeback as a young Ken Griffey Jr absolutely flies around the bases to score from first. No. 14: Oct. 23, 1993: Phillies @ Blue Jays; Joe Carter‘s walk-off WS homer foils a great Philly comeback. No. 13: Oct. 26, 1997: Indians @ Marlins; Edgar Renteria wins it for Fish in a World Series game 7 classic. No. 12: Oct. 31, 2001: D-backs @ Yankees; Tino Martinez ties it with a 2-out, 2-run homer in the bottom of the 9th and Derek Jeter hits first November homer and earns himself the nickname for which he’s continued to be known. No. 11: Oct. 2, 1978: Yankees @ Red Sox; Bucky Dent‘s improbable 3-run homer caps a massive October collapse for Boston and continues the legendary rivalry between the teams. No. 10: Oct. 15, 1988: Athletics @ Dodgers; Injured slugger Kirk Gibson hits a pinch hit walk-off home run off of the dominant Dennis Eckersley for one of the most magical home runs in baseball history. No. 9: Nov. 4, 2001: Yankees @ D-backs; Luis Gonzalez floats a ball over the drawn-in infield against Mariano Rivera to win a classic Game 7. No. 8: Oct. 12, 1986: Red Sox @ Angels; Dave Henderson hits an improbable 3-run homer in the 9th to help Boston come back from 1-out away from elimination to eventually beat the Angels in the 86 ALCS. No. 7: Oct. 14, 2003: Marlins @ Cubs; The infamous Steve Bartman game, which overshadowed an utter collapse by Mark Prior, Alex Gonzalez, the Cubs bullpen AND Kerry Wood the following day to continue the Cubs curse that lasts til today. No. 6: Oct. 16, 2003: Red Sox @ Yankees; Aaron Boone suddenly homers off Tim Wakefield in extra innings to end a classic ALCS game 7 between the bitter rivals. No. 5: Oct. 15, 1986: Mets @ Astros; Mets win in 16 as Jesse Orosco put in the relief performance of a lifetime. No. 4: Oct. 14, 1992: Pirates @ Braves; the injured Sid Bream barely beats Barry Bonds‘ throw to score the series winner and effectively send the Pittsburgh franchise into a 20 year tailspin. No. 3: Oct. 25, 1986: Red Sox @ Mets; Probably the most “infamous” game of all time, especially to Boston fans, as Bill Buckner‘s error follows a series of mishaps by the Red Sox pitching staff to turn a 10th inning 2 run lead into a game 6 loss. No. 2: Oct. 27, 1991: Braves @ Twins; Jack Morris‘ seminal performance; a 1-0 10 inning shutout over the Braves in perhaps the best Game 7 of any World Series ever. No. 1: Oct. 21, 1975: Reds @ Red Sox; the game forever known for Carlton Fisk waving his walk-off homer fair, but which should be known for the unbelievably clutch Bernie Carbo 8th inning homer to tie the game and enable the extra inning fireworks. That’s a great list. It technically should have been titled “Greatest 20 games of the last half century” since it skipped the classic 1960 Mazeroski game. 2011 Game 6: I thought it was a top 5 game when I saw it live, and i’d put it 4th or so on the above list. 2016 Game 7: I thought it was perhaps in the 5-10 range, putting it just after the Bartman game at #8 in the above list. Well, where do you possibly put the two crazy games we just saw in this series? 2017 Game 2: Houston scores in the 8th and 9th to push the game to Extras, blasts two solo homers in the 10th only to have LA tie the game in the bottom of the 10th. 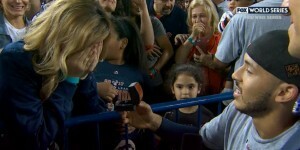 Eventual MVP Springer blasts another homer in the 11th, and LA counters in the bottom of the 11th but falls short. 7 of the 13 runs scored in the game occurred in the extra innings and the teams set a WS record hitting 8 combined homers. First off; were these truly “great games?” One game was 7-6, the other was 13-12. Both featured a ton of hitting and offense obviously, but not a ton of good pitching necessarily. LA used NINE pitchers in Game 2, and the teams combined to use 14 pitchers in game 5 with neither starter getting out of the 5th. Game 5 in particular featured both team’s Aces (Kershaw and Keuchel), both former Cy Young winners who both got blasted, and both team’s best reliever (Jansen and Devenski) got hit hard as well. Some people think a “great game” includes transcendent performances on both sides of the ball, and both of these games were not the case. Would you put either game into the above list? I would. I’d probably choose Game 2 over Game 5 given its late-inning heroics and slightly better pitching, and I’d probably put it in the 15-20 range in the above list. Where would 2016 World Series Game 7 rank historically? So, we just saw a pretty darn good World Series, culminating in a very good Game 7. The Cubs win was obviously historic; no need to repeat all the other post-game analysis going on to that end. The question here is; where does Game 7 rank historically? We all suffer from recency bias, and many (most) of us were not around for such other classic games (1924 World Series game 7 going 12 innings and Walter Johnson pitching 4 innings on one day’s rest, 1960 game 7 featuring Mazeroski‘s famous walk-off homer, or Bobby Thompson‘s “Shot Heard ‘Round the World” to win the 1951 NL Pennant). The normally sane Jayson Stark just posted that 2016’s Game 7 was “the Greatest ever game” in the long history of the sport. However, I’m skeptical of calling *anything* that just happened, the best ever, so quickly after it ended. On the “plus” side for its lofty status; Game 7 featured two long suffering franchises and was historic just on its own because of it. It was a Game 7, which only happens about one in every four Series. It went into extra innings, only the fifth time that’d ever happened. It featured a clutch and improbable late inning comeback to tie a game that seemed out of reach (Rajai Davis‘ 8th inning homer off of Aroldis Chapman), and it ended with the tying run on base and the winning run at the plate for nail-biting. On the “negative” side; it was a sloppy game (4 errors, 3 by the winning side) that featured decidedly “un-clutch” pitching performances by the two marquee relievers (Chapman and Andrew Miller), both patently exhausted from their workloads this post-season. Neither starter even qualified for a decision. The pitching in general was substandard; the teams combined for 24 hits and 15 runs; this is a far cry from Jack Morris‘ 10-inning shutout in the 1991 Game 7. And thanks to the continuing trend of endless delays caused by interminable mound visits and bullpen switches, the game time (not even accounting for the rain delay) was nearly 4 and a half hours. So, for me, no this wasn’t the greatest ever game. But it was still darn good. How good? No. 19: Oct. 4, 2003: Giants @ Marlins; future Nat Ivan Rodriguez tags out Eric Snow as he tries to bulldoze Pudge at the plate to end the game and send the Marlins to the World Series. No. 7: Oct. 14, 2003: Marlins @ Cubs; The infamous Steve Bartman game, which overshadowed an utter collapse by Mark Prior, Alex Gonzalez, the Cubs bullpen AND Kerry Wood the following day to continue the Cubs curse that lasted … until this week. I put 2011 Game 6 fourth, just after the top 3 games above. I think I rank 2016’s Game 7 slightly behind it, perhaps (and this would be rather ironic) just before or just after the Bartman game. I think the top three games on this list are so iconic that they’d be hardpressed to beat, and we quickly forget just how amazing the 2011 game 6 was in terms of multiple improbable comebacks. What say you? How great do you think Game 7 was earlier this week? Am I under-rating it? Over-rating i? 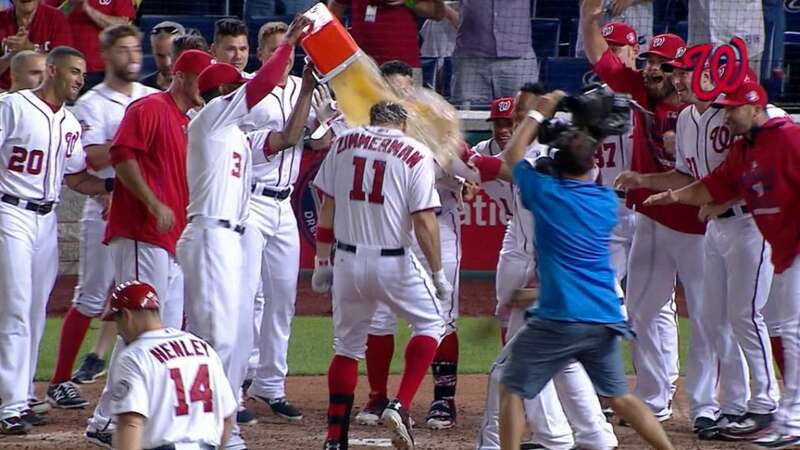 When we last checked in on Ryan Zimmerman, aka Mr. Walkoff, it was July 2013 and he had just hit his 9th career such homer. Well, last night he hit another. His 10th career walk-off, an excuse-me shot down the RF line that bounced off the flag-pole and won a fun back-and-forth game against the visiting Yankees 8-6. Here’s his career homer log via baseball-reference. The game-winner in the Nats Stadium opener in April 2008, salvaging a blown save in the top of the 9th. A 2-run walk-off against Chien-Ming Wang on Fathers Day 2006 against the Yankees, a game in which the team set its long-running regular season attendance record. 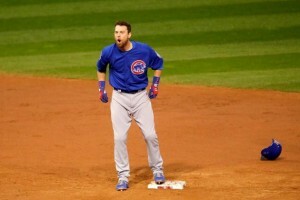 But walk-offs are always awesome to watch, whether you’re at home or elsewhere. Thanks to this SI.com article by Jay Jaffe, which did the baseball-reference.com play-index work for us, we know that Zimmerman is now tied for 10th all time in walkoffs. The current active leaders in walk-offs are two noteworthy names; David Ortiz connected for his 11th and most recent walk-off homer on 6/6/13, as detailed by Billy-Ball.com. Albert Pujols either has 10 or 11, depending on if you believe his homer log (which has him at 10) or B-R’s play finder, which says 11. Since B-R itself says the Play Index data is more up-to-date, I’ll go with 11. Jim Thome hit his 13th in June of 2012 to take over the career lead just before he retired and is the all-time leader. Just behind Thome, tied for 2nd all-time, is this quintet of Hall-of-Famers: Jimmy Foxx, Mickey Mantle, Babe Ruth, Stan Musial and Frank Robinson. That’s quite heady company; every name I’ve mentioned here is either a Hall-of-Famer or should be. Being that Ortiz is nearly done, and Pujols is on the decline, and Zimmerman is just 30 and may have another decade in him, it seems like a safe bet that Zimmerman will eventually be the all-time walk-off leader. Heck, he already had seven through is first 5 pro seasons. We’ll keep track every time he hits one for sure. NatsJournal, which has descriptions and links to video for all 10! 10. Home vs Yankees, off of Andrew Miller (his first runs allowed of the year). Who *really* should be in the HR derby? I have to admit it: the home run derby has probably become my favorite part of the all-star game festivities. That and the futures game of course. The all-star game itself has devolved into a farce with a slew of issues (I posted a lot of these criticisms in my 2011 Nats all-star piece, and they remain issues today, so no need to go back into them here). Lets talk about the Home Run derby. I kind of like the wrinkle of naming “captains,” which for this year occurred on 6/23/14. But the captains have to pick the right guys. I hate the format; when a guy like Josh Hamilton is remembered for his epic performance in an early round moreso than the winner, something’s wrong with the format. But they’re changing it this year. And the players take *way* too many pitches. But whatever. This year’s captains are Troy Tulowitzki and Jose Bautista. Fans can vote on who they want to see in the competition. Giancarlo Stanton: owner of 3 of the biggest 11 homers on the year, on pace for 45+ homers, leading the NL in home runs. And he wants in this year. Bryce Harper: last year’s runner-up is one of the few players in the majors scouted with 80 power; despite his injury-plagued season he belongs in this competition. Michael Morse: not too many all-or-nothing hitters like Morse, whose name dots the leader board on hittracker. Evan Gattis: you don’t just turn on chest-high fastballs from Strasburg if you’re a plain ole hitter. 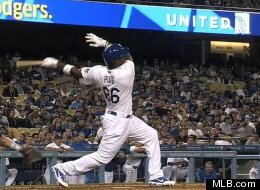 Yasiel Puig: just because. Can he do a bat flip after every homer? Troy Tulowitzki: He’s in as a captain, but even despite that selection he’s a decent choice: he’s 5th in the majors in ISO and tied for 6th in Homers. Paul Goldschmidt: has the power capabilities and the overall game. But he’s not nearly as explosive as the guys above. Ryan Howard: He may not merit inclusion based on his performance, but he’s a classic three-true outcomes hitter. Lefties get him out with ease; i’m sure batting practice pitchers don’t. Todd Frazier: his power numbers spike thanks to playing in Cincinnati, but he’s still got some serious underrated power. Justin Upton: Owner of the 3rd longest homer on the year. Yoenis Cespedes: gotta let the man defend his crown. Edwin Encarnacion: MLB leader in Homers as of this writing. Has to be in this competition. Jose Abreu: MLB leader in ISO and on a 40 homer pace despite hitting the D/L. David Ortiz: Owns the 2nd longest homer hit this season and would make a nice homecoming in Minnesota. Mike Trout: He’s such a good hitter, that he could just sit at the plate and hit homer after homer. And, he just hit a 489 foot homer to take over the longest homer of the year. Jose Bautista: He’s a captain, so we’ll list him here. Otherwise he’s a stretch to make this list. Victor Martinez: he’s quietly one of the best power hitters in the league right now. Mark Trumbo: too bad he’s hurt; he’s a great power hitter to watch. Nelson Cruz: his homer totals may be augmented by playing in Baltimore, but he’s still putting numbers on the board. Adam Dunn: you know he’d be a favorite to win if he was named to this team, but I could only select 5. He’d be the 6th man in for the AL. Are these the best lineups you could possibly ask for in this competition? Who else would you put on this list of power-crazy players? Jim Caple posted his own tongue-in-cheek version of this same post, worth a read for a quick giggle. There’s a handful of other DH-only types in the AL (Billy Butler, Chris Carter, Adam Lind, Juan Francisco, etc) who might make sense. (I used three resources to name these names: the current major league leaders in Homers, the current major league leaders in Isolated Power, and an eyeballing of the leader board for most astoundingly long homers on the year from Hit Tracker Online. All stats are as of 6/24/14 and may have changed slightly between then and the publication of this post). 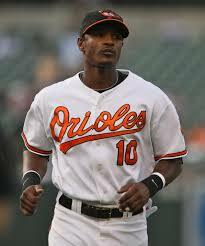 Adam Jones; my #1 fantasy draft pick in 2014. Photo unk. As with years past … feel free to skip this post if you don’t care about fantasy. I know for certain that reading about someone elses’s fantasy sports team can be a bit grating. But, if you do play fantasy i’m sure you’ll at least appreciate reading the selections and then looking at the team’s strength analysis at the end. I’ll include a jump line so your RSS feeds aren’t blown out either. 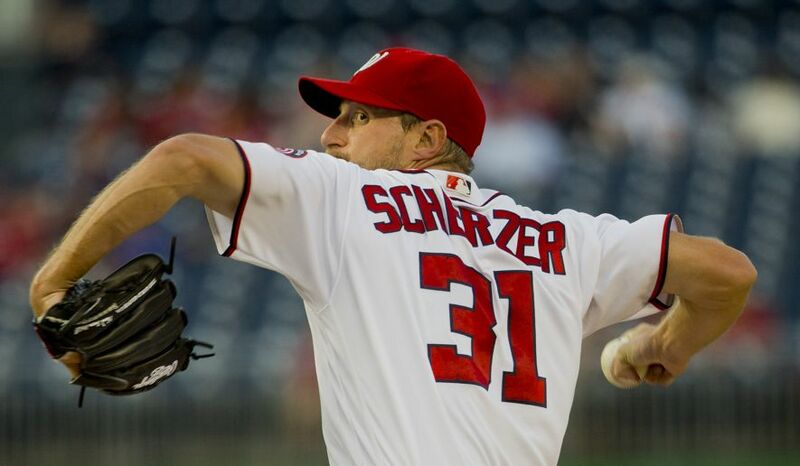 Nationals Arm Race Best Stories for 2013; Happy New Year! On the last day of 2013, I thought I’d take a quick peek back at the posts and discussion that shaped the blog this year. Here’s a highlight reel by month of the most read and commented-upon posts in this space, as well as recaps of major events and personal favorite entries. Gonzalez linked with PED-clinic; are we worried? (Turns out Gonzalez was the sole player who was exonerated out of this scandal, which threatens Alex Rodriguez to this day). Are players from the 1980s under-represented in the Hall of Fame? (Yes, I think they are). Soriano? Well at least its Rafael and not Alfonso (Soriano ends up having a serviceable 2013 but arguably disrupts the mojo of the bullpen, which finishes ranked 17th-19th in most major statistical categories). How good is an “All Virginia” team? (Pretty good as it turns out, but not nearly as good as an all-Maryland team, led by Babe Ruth and Cal Ripken, Jr.). Gonzalez to play in WBC: why this is really Bad News for the Nats (Gonzalez ended up regressing in 2013 but didn’t fall off a cliff/get hurt like other Nats pitchers that were WBC participants). Why is Toradol “ok” but Steroids and HGH “bad?” (I still don’t know the answer, but this issue continues to come up again and again, especially during HoFame voting season). Washington is a Football Town; What’s yours? (Still Football despite all of Danny Snyder‘s hard work to kill the golden goose). Pitcher Wins on the Free Agency Market; an analysis (a recurring $/win analysis post that I’ll revisit in 2014 once all the major FA pitchers are signed). Why does MLB want to damage its sport with an International Draft?? (because owners are cheap and they’d rather save a couple million on amateurs instead of blowing it on mediocre veteran 5th starters). Are we too worried about pitch counts? (yes we are; Davey Johnson mis-managed the pitching staff in this regard many times over the course of 2013). 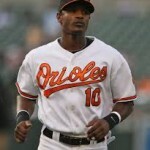 Does Andrus’ new contract really affect Desmond? (yes I think it does; if Andrus is worth 8 figures so is Desmond … a factor this team needs to start planning for). Braves sweep shows some areas of concern (the three concerns were mis-management of the pitching staff, Zimmerman‘s throwing arm and the offense; these concerns did not get corrected all year). Davey Johnson: Over Manager (another complaint about Johnson’s decision making). Minor League Pitching Age Appropriateness for 2013 (the main take away was that our Hagerstown rotation was very old for its level). Injuries and Idiocy lead to interesting Call-ups (a theme all year, with the team surprising us with Jordan, Krol, Karns and other callups). Maya DFA and outright; the end of an era: (Maya was DFA’d in May, released in November). Nathan Karns: First look: (Karns surprise call-up and review of his debut). First Look; Nats top 10 rounds of 2013 Draftees (I also tracked local and Virginia draft prospects all spring and had a separate post just about them). Virginia Region and State High School Results and Recaps (last in a running recap of local High School baseball tournament play recaps). College World Series Finals: UCLA Wins (the last in a series of CWS recap posts; I feel like i’m one of the only DC bloggers who pays attention to local or college baseball). Haren’s 6 week Demotion, er I mean D/L Trip (we forget just how bad Haren was at this point in the season; he was 99th out of 99 qualifying starters in ERA). Taylor Jordan: First Look: (the culmination of a pretty story-book season for Jordan). Nats all-star review: 2013 and years past (Bryce Harper remains an answer to one of my favorite baseball trivia questions: what 3 players were selected to the all-star game in every season in which they appeared in the majors?). How much live action occurs in each sport? Ball-in-Play studies summarized (I’ve been working on this post for years, looking for data … still could use better data). 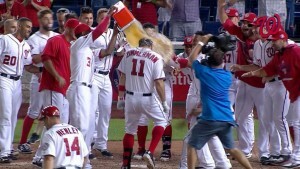 Ryan Zimmerman; Mr. Walkoff; (his 9th career walk-off homer, not too far behind the all-time leader Jim Thome at 13). Is it time to fire Davey Johnson? (nope; they stuck with him and rebounded eventually … but it was too late). First Look: Tanner Roark (one of the best stories of the season for this team; i’m an unapologetic fan. I did another gushing post 3 weeks later). Virginia Little League loses in Regional Final (as with HS and College ball, not a whole lot of coverage of Little League ball in the blogosphere either). Why aren’t the Nats getting Harper’s back?? (a great question, and one that I laid on the hands of the manager. Lets just say this; I don’t think Matt Williams will have the same problems in 2014). What will Shark fans do now? (Roger Bernadina released after nearly a decade in the organization). Matt Harvey; just unlucky (discussion on Harvey‘s UCL injury; its hard to understate just how dominant a season he was having statistically). Season Statistical Review of all Nats 2013 draft picks (a great way to stay current on all our draft picks; I also did this for all the 2012 picks too). Great performances from Nats minor league teams in 2013… (4 of 6 domestic teams making the playoffs). 11 games over .500, 4 1/2 games back. (a late season charge left a glimmer of hope, soon extinguished). 2013 Pre-season Rotation Rankings revisited (possibly a record for the number of player name tags used on this blog). Nationals 2013 post-mortem (a cathartic b*tch session about everything that went wrong this season). Roster construction of 2013 playoff teams (something I like doing every year). World Series Game 6 Pitching Matchup and Prediction (I ended up posting a whole slew of game-by-game predictions during the post-season this year, and this was the last such piece). What “proof” is there that David Ortiz used PEDs? (in my opinion, the “proof” is pretty thin, unless you’re a fan of anonymous lawyers and the reliability of their testimony). Will the Cardinals get the same grief we got over not using Shelby Miller? (answer: nope). Repost: Why didn’t Carlos Gomez get more NL MVP support?? (My belief is that Mike Trout for MVP votes are just as narrative driven as the Cabrera-for-MVP votes). 2014 Projected Pitching Staffs and Rotations; entire Nats system (the last major bit of analysis for the Nats this year). Happy New Year! Its been fun. What “proof” is there that David Ortiz used PEDs? And thus his accomplishments (and eventual Hall of Fame case) are forever tarnished. Here’s the thing: what “proof” exactly is there that David Ortiz used PEDs? (You know, David Ortiz, who just came in 3rd in the Boston mayoral race). Hmm. This sounds awfully thin to me. Anonymous lawyers who claimed to have “knowledge of the results” of the 2003 surveys, who did not go on record and didn’t identify the supposed substance. AND, to make matters even worse, these lawyers were knowingly breaking federal laws by disclosing information that was a) supposed to be confidential and b) at the time under seal. Why would anyone believe this? Think about that. Ortiz could have been drinking some supplement that was legal then, is legal now, but which triggered a positive test. Ortiz has vehemently denied initially or ever using anything illegal whenever it has been brought up since. Of course, those denials run shallow considering that every PED-suspected user denies in the same way. Ortiz does not appear in The Mitchell Report; go ahead and search its 409 exhausing pages and there’s no mention of him. Nor does Manny Ramirez (ed; corrected after the fact; i had written Manny Rodriguez), who was also outed in the 2009 NY Times article. Ramirez’ reputation has since been sullied through his own stupidity and multiple subsequent positive tests … but I can’t help but wonder if Ortiz wasn’t being unfairly targeted by some faceless “lawyer with knowledge” who could very well have been a die-hard New York Yankees fan (this is the New York Times after all, and these proceedings were all conducted in New York City) with an axe to grind. You may think this is a cynical approach. You may have blind faith that the journalist in question took his “sources” to his editors, who should have vetted the information and made the decision to publish based on such anonymous quotes. And to that I say, you’re a fool if you think that all journalists are prim and proper and squeaky clean in terms of their morals. You don’t know these people, you don’t know who their sources are, and you don’t know the motivations behind the breaking of federal laws in order to … do what exactly? Purposely tarnish the career of a player who didn’t do anything to anybody, and who apparently may not have even used the damn PEDs in the first place. I find it troubling, that a man’s career, legacy and reputation are basically shot because of some unconfirmed report. If this was in a court of law, the “evidence” against Ortiz would be considered so thin that any right-minded judge would dismiss the case outright before it even began. Ortiz commented on this topic in an SI piece recently and I can’t help but agree with his take on the situation. He felt helpless, he (claims) not to have ever heard anything about a positive test until his name appears in the New York Times. He claims that he’s asked repeatedly for additional proof, for the name of the drug he supposedly tested positive for … and has never been told! Think about that. The people who hold the evidence that has destroyed his legacy are refusing to give him details about his own test and his own career. I’m not the only one with this view: Ken Rosenthal discusses many of the same facts in this May 2013 article. Well, I was 4-for-4 leading up to game 5 predictions … and was wrong. I thought St. Louis could break out against the weakened Clay Buchholz. But they couldn’t do anything against a clearly laboring Buchholz, doing nothing against mid 80s fastballs throughout the night. Wainwright made some mistakes that cost him (0-2 hanging curve in the 1st, then not pitching around David Ortiz being early, simple examples). In the end, perhaps trying to predict either Game 6 or a possible Game 7 is fools-gold; I think we now see that Boston is the superior team and has worked around its own offensive deficiencies and a stitched-together rotation. They get Mike Napoli back in the middle of their lineup now that they’re back in the AL park using DH rules, and at some point this will make the difference. Game 6: Michael Wacha versus John Lackey; Simply put, I think Wacha’s amazing run of unhittable-ness may end tonight. You have to think Boston’s going to go back to the film, look for a weakness, and try to exploit it. Lackey probably puts in his typical quality start; 6 innings, 2 or 3 runs. It just seems that fate is going to go Boston’s way after they clawed 2 of 3 in St. Louis. I’m going with Boston closing out the series tonight in a memorable night for Boston fans, finally clinching a World Series on home soil. 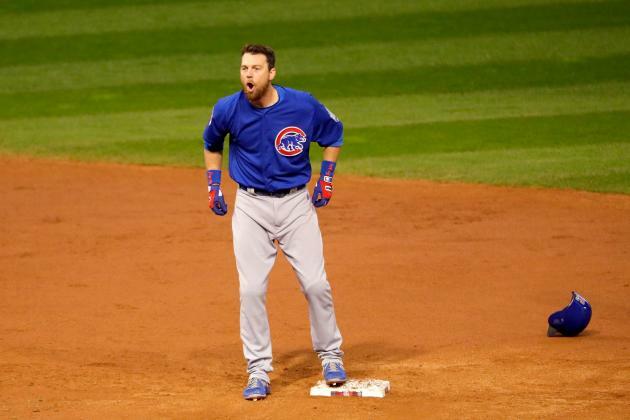 Oritz is your obvious World Series MVP and bolsters his eventuall Hall of Fame case. The series heads to St. Louis after the teams split in Boston. However, the predicting gets harder from here on out, as each team gets deeper into its rotation and has to rely on lesser starters. Game 3: Jake Peavy vs Joe Kelly. Kelly was pretty good in September, lowering his season ERA from the 2.80 range to the 2.60 range, and Kelly pitched a nifty 6ip/2ER home start in the NLCS. Peavy was not good in September, leaking runs left and right. 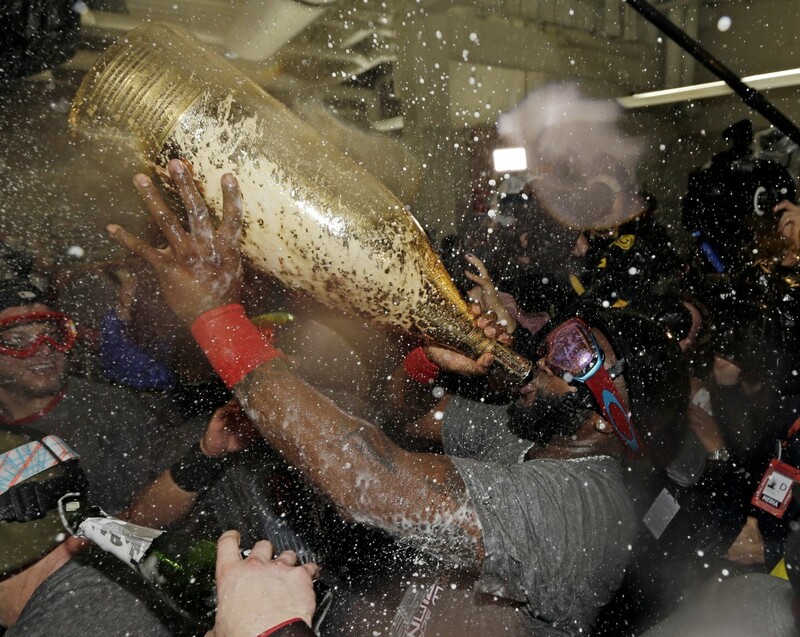 Peavy got hammered in the ALCS in Detroit. All signs point to St. Louis jumping up 2 games to 1 in this series and putting a lot of pressure on the Game 4 starters (perhaps Clay Buchholz and Lance Lynn). Boston obviously needs to take a game in St. Louis or they’re done. And unless they want to take their chances beating Michael Wacha in a game 7 back in Fenway, they want to get two. Kelly’s no pushover; he may look like an accountant but he throws some serious cheese: 94.4 average two-seam velocity with a peak of 98.8 this year. Boston has its work cut out for them. Meanwhile Peavy hasn’t been good, and I think the Cardinals jump on him quickly. Because they’re in St. Louis, Boston has had to choose between sluggers, and Mike Napoli misses out. This takes away a slugger in the middle of Boston’s order and puts a severe defensive liability at first in David Ortiz. I think this and the return home to the charged up St. Louis crowd spells a Game 3 victory for the Cardinals.